We know that moist soil is a fairly good conductor of electricity. It is not actually the water in the soil that provides conduction, because chemically pure water is a good insulator. Electrical conduction is provided by dissolved minerals in the water. The minerals are said to be in water solution. Atoms of minerals in water solution (sometimes also called an aqueous solution) have positive or negative electric charges, and these electrically charged atoms move toward electrodes placed in the solution. Positively charged atoms move toward the negative electrode as shown in figure, and negatively charged atoms move toward the positive electrode. This movement of charged atoms is an electric current. Electricians who work with electroplating equipment are concerned with the conduction of electricity by liquids with some type of salt in solution. For example, suppose we wish to electroplate a fork with copper. A solution of blue vitriol (copper sulfate) in water is used. The fork forms the negative electrode (cathode), and a copper plate forms the positive electrode (anode). Copper sulfate dissolves to form positively charged copper atoms. Therefore, the charged copper atoms are attracted to the negative fork, and a film of metallic copper is deposited on the fork.If we wish to silver-plate a fork, we will use a solution of silver cyanide. Silver cyanide is a poisonous silver salt that dissolves in water to form positively charged silver atoms. 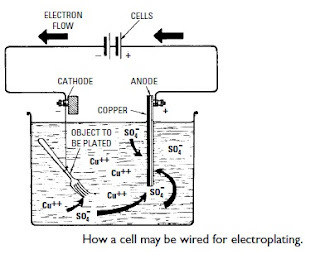 Thus the electroplating process is basically the same as in the case of a copper sulfate solution. If we wish to gold-plate a fork, we will use a solution of gold cyanide. Gold cyanide is also a poisonous salt. Therefore, appropriate care must be observed by electricians who work with electroplating equipment containing cyanides. Even a small amount of cyanide can be deadly if taken into the human body.